Defending champion Viddora produced a slick gallop to wrap up her preparation for the 2018 Group 1 $1m Crown Perth Winterbottom Stakes (1200m) at Ascot in Perth on Saturday. Viddora, above, is in great shape to defend her title in the 2018 Winterbottom Stakes at Ascot in Perth. Photo by Ultimate Racing Photos. 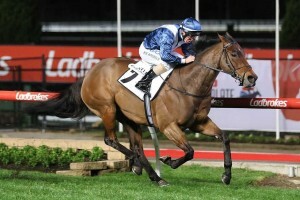 Viddora claimed her maiden Group 1 win and trainer Lloyd Kennewell’s first Group 1 win in the last year’s Winterbottom Stakes and the Caulfield trainer said the mare was in similar order as she was twelve months ago. Race day jockey Joe Bowditch was aboard Viddora this morning when she stretched on the Ascot course proper, running the last 400m of her 800m gallop in 23.5 secs and Kennewell said he couldn’t wait for Saturday to arrive. “This morning she just strode off from the 1400m and worked over half a mile (800m) and ran her last 400m in 23.5 secs under a nice hold and she had a nice blow and I am very happy with where she is at,” Kennewell told Sky Racing’s Racing HQ. A final field of fifteen sprinters will line up in Winterbottom Stakes and Kennewell said he wasn’t too concerned with what barrier Viddora will get at today’s barrier draw, but he would like to avoid the inside gate. “I am not really worried about the draw to be honest. You can’t change it, you can’t make it,” Kennewell said. Jockey Joe Bowditch, who relocated from Adelaide to Melbourne this year when Kennewell made the same move, has been Viddora’s regular rider throughout her career and will be aboard again in Saturday’s weight for age Winterbottom Stakes. Bowditch has been aboard Viddora for her two Group 1 wins and as well as last year’s Winterbottom Stakes victory, the pair combined for a win in the Group 1 $500,000 Charter Keck Cramer Moir Stakes (1000m) at The Valley on September 28. Viddora has had plenty of time to get over her unplaced run on a heavy track when tenth of twelve behind Redzel in the $13m The Everest (1200m) at Randwick on October 13 and will go into Saturday’s feature Ascot Racing Carnival sprint as the one to beat again. Ladbrokes.com.au have Viddora as the $3 favourite to win back to back Winterbottom Stakes with her nearest rival in the betting the Western Australian trained Enticing Star at $6. Betting for the 2018 Winterbottom Stakes at Ladbrokes.com.au: $3 Viddora, $6 Enticing Star, $8 Malaguerra, $8.50 Voodoo Lad, $10 Runson, $12 I’ll Have A Bit, $15 Dainty Tess, $16 Malibu Style, $18 Ashlor, $21 Durendal, $41 Valour Road, Belter, Profit Street, Seannie, $91 Rebel King.